My name is Jasmine and I want to share my story with you. I am currently 23 years old with a 3- year-old son that I love with all of my heart. Three and a half years ago I was barely about to graduate high school, and I was taking care of my three younger siblings with little help. I also had to deal with hearing my mother complain or threaten to kick me out of the house constantly. My father was in and out of jail, and I only saw him twice before 2013 when he decided to move in with us. Everybody that knows me knows that I didn’t have a really good childhood. I almost failed high school because nobody cared about my grades or how I was doing. This extremely affected me to the point where I began to not care if I graduated or not. Luckily, I had a great mentor who cared about me and helped me graduate in 2013. Fast forward to the summer of 2013…this is when my life changed. My mother said I had to leave and almost stabbed me, so I ran out of the house and never went back. I was homeless, jobless, and struggling. I moved from family members’ houses and then couch-hopped at friends’ houses. On December 17, 2013, I found out that I was 6 months pregnant by a guy that I barely talked to at the time and had no idea what to do. I was sleeping on my cousin’s couch while pregnant. April 16, 2014, I had an emergency c- section and gave birth to a handsome boy named Jeremiah. Luckily, my sister’s stepmom let me stay at her house after I had my son. However, it was a temporary living situation. I contacted Coordinated Service Planning and they told me about a program called Assisting Young Mothers (now called Second Story for Young Mothers). I went through the whole process of applying, interviewing and completing a mental health assessment. My life changed when I got that call and was informed that I could move in. I was so happy because life finally started to look up for me and my son. I was able to hope again. In Second Story for Young Mothers, the rules at first were hard to get used to: curfew, chores, groups, case management, and therapy sessions once a week. Before Second Story for Young Mothers I never worked a day in my life, and didn’t have access to affordable childcare. 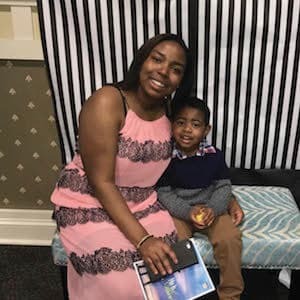 Being in Second Story for Young Mothers helped me tremendously with getting my first job, saving money, working with my child developmentally and being a better person in general. I was the biggest complainer when it came to groups on Monday and Tuesdays. Especially if the weather was bad, even if I knew I still had to come I would still complain. (: But the staff worked with me, and continued to encourage me on moving towards my goals to become self-sufficient. They never gave up on me. They referred me to an internship for childcare, and I was able to get hired afterwards. With this steady job, I was able to save way more money and accomplish my short-term goals I had set for myself in Second Story for Young Mothers. I was able to graduate to Second Story for Young Mothers Next Steps, and soon afterwards I was granted the opportunity to be accepted to Bridging Affordability. Bridging Affordability was a huge accomplishment for me because it finally provided stability for me and my son. It was our first apartment that I was proud of and I could not have gotten there without the help of Second Story for Young Mothers staff. During my two years in Bridging Affordability I have kept my job, gotten my CDA (Child Development Associate Credential), saved money, and accomplished more goals that I set for myself. I also was able to go back to school and I learned to pay my bills on time. During this time I also got my driver’s license and a car, and even went to a First Time Home Buyers certificate course. When I leave Bridging Affordability I will be taking all the knowledge and life skills that I have learned for the past 3 and a half years. My son and I are truly blessed to have the opportunity to have been at Second Story for Young Mothers, Second Story for Young Mothers Next Steps, and Bridging Affordability. I know for a fact that I will miss Ms. Angel. She is such a hard worker and just really wants the best for all the young mothers that she encounters. I will never forget this program and all that it helped me with. My son and I will forever be better because of Second Story for Young Mothers.